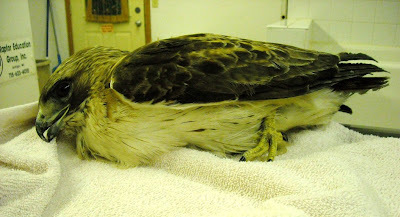 Several Red-tailed Hawks have been admitted during the past week. It has been frustrating seeing them come in several at a time and from different parts of the state. All seem to have neurological symptoms such as unable to stand and a sense of being unaware of their surroundings. The birds are also starving. The starvation is due in part to paralysis of the throat leaving them unable to swallow normally. We are tube feeding all of these patients liquid food until they are able to eat once again on their own. It is labor intensive to care for birds in such critical condition but seeing them get well and fly free again makes it worth it all. The cases are reminiscent of West Nile Virus , a virus we saw in large numbers several years ago in the Mid-West. 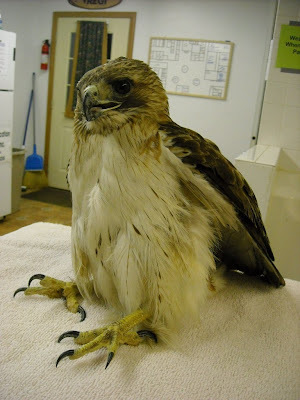 We hoped we had seen the last of this virus, at least in terms of it being a problem to many birds in Wisconsin. 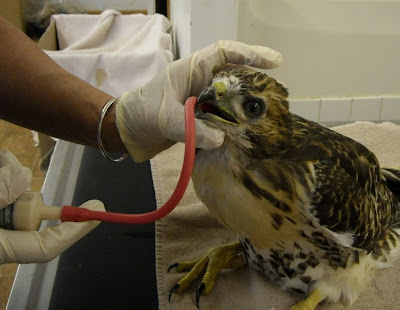 Given the past week of admissions we will need to test the birds before we can be sure what is causing the symptoms. Lets all hope it is some odd coincidence and not WNV. Generally the birds in an region will be come immune to the virus as time goes on. The development of what becomes a natural immunity is the reason we see less of a virus. Problems arise if the virus mutates into a similar but slightly different virus to which the birds have no immunity. I will be delighted beyond words to be wrong about this "gut feeling". There are lots of updates on patients I have written about in previous blogs. I love that readers are interested and call to find out what is happening with the "blog birds". :) Knowing these little darlings get you are "hooked" as they do us warms my heart. The Great Blue Heron chick that came in near death just a week ago is growing fast. He is standing and eating TONS of minnows and beef heart. 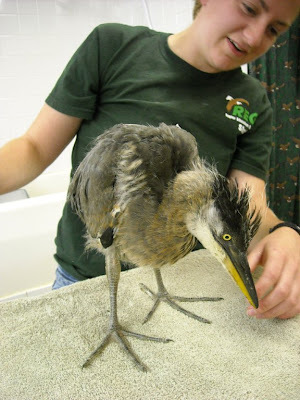 It gives us a great appreciation for what adult herons put up with at the nest. 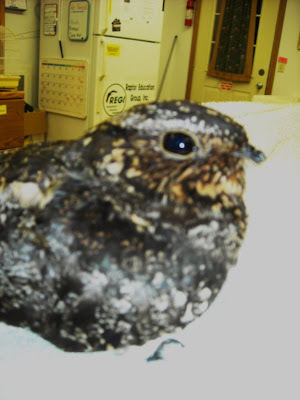 The Common Nighthawk that came in starving and suffering a wing injury is well on her way to recovery. Lance has been exercising her in the flight hall and today she actually flew upwards and flew the length of the hall ( 100'). She is up to a normal weight again as well. That speaks volumes for my staff. 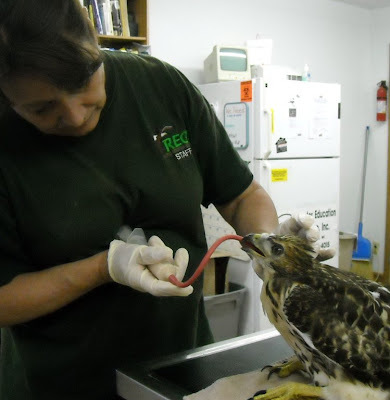 Nighthawks have to be hand fed every single piece of food they eat. This beautiful bird will be spending more time in rehab before she is ready to be released, but we are excited with her progress. 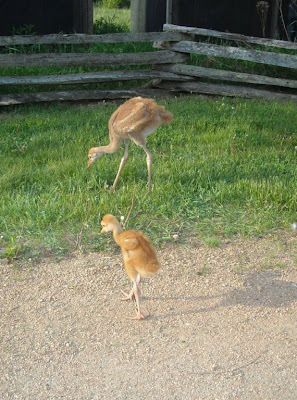 Our Sandhill Crane colts are growing quickly. The oldest colt is now flapping his wings in preparation for flight. It is hard to believe they go from a 6 inch tall hatchling to a full grown and flying crane in 56 days! The youngest colt has had some health problems that caused some delay in her growth. We hope those issues are behind her now. Lastly, it came to my attention that several people that brought baby robins in during the past few days called when reading my blog entry concerning the starving baby robin that someone wanted to keep as a pet. Apparently EVERYONE thought I was writing about them! The truth is we get in many babies a day and robins are a common patient to be admitted. We admitted four yesterday for instance. If you had good intentions with the bird it was most definitely NOT about you. The party that I wrote about knew what was happening and didn't care. THAT is why is was so frustrating. BTW The robin did live and is recovering. Babies are calling so I must sign off and tend to them. I love hearing from you. It will be another long one here tonight.